It's amazing what $170 million dollars can do. Five years ago, writer/director James Gunn was more commonly known for creating Troma-esque horrors (2006's Slither) and — perhaps regrettably — filming a scene in which Canadian sweetheart Ellen Page rapes Rainn Wilson (the unfairly maligned Super). Now, with the weight (and finances) of Marvel Studios behind him and having just released the most hotly anticipated movie of the summer, he's become one of the most iconic filmmakers of his genre. Not that it's surprising — Guardians of the Galaxy, the big-budget follow-up to the 2012 blockbuster smash The Avengers, is likely the most fun you're going to have at a movie theatre this year. How does a bargain bin comic book with questionable artistic and creative value become what is likely going to be one of the biggest box office hits of 2014? It all has to do with its source material. By creating a film focused on one of the Marvel Universe's most unpopular storylines, Gunn has been given free reign to re-invent and reinterpret its subject matter. The characters' names are the same, but the rest of the film feels downright different. An all-encompassing escapist fantasy of Star Wars-like proportions, Guardians of the Galaxy tells the story of Peter Quill (Parks and Recreation's Chris Pratt), a young boy who's abducted from earth in 1988 and grows up to become a mercenary man-child employed by an adoptive gang of ravaging space pirates. However, when Peter (or, as he'd like to be known, Star-Lord) goes rogue and discovers an ancient, sphere-like artefact, the whole galaxy is put in danger by his clumsy criminal ways. 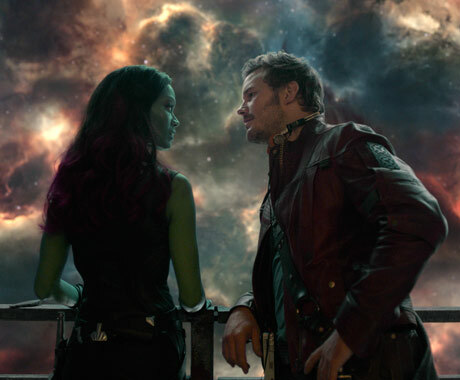 With a bounty put on his head (primarily by the power-hungry Kree leader Ronan, played here by Lee Pace), a team of miscreant creatures — including a barely recognizable Bradley Cooper as the voice of humanoid space raccoon Rocket; monosyllabic Groot (Vin Diesel); and adopted assassin Gamora (Zoe Saldana) — try their hardest to capture Quill and receive some much-needed space bucks. But when the crew discovers just how powerful the mysterious orb really is, the intergalactic misfits must band together — along with literal-thinking strongman Drax (played by real-life WWE superhero Dave Bautista) — to save the universe. Fans of Gunn's oeuvre may find Guardians of the Galaxy a lot less over-the-top and outrageous compared to his past material. However, the film finds the visionary storyteller consciously converting all his outsider energy into an easily digestible but nevertheless pleasing package, one that surely rivals the in-crowd witticism of Joss Whedon's Avengers. The film plays out like a romantic space opera of the Flash Gordon variety. All the B-movie accoutrements are there, but there also seems to be an underlying understanding of sci-fi and fantasy fiction's past and place in society that elevates this colourful piece of cinema to Criterion Collection levels of excellence. Anchoring the film is an all-star ensemble — lead by the affable and charming Pratt — that employs the kind of comedic timing and camaraderie more associated with the Second City crowd than the fine folks at Silver Snail. Still, the strength of Guardians of the Galaxy lies in its accessibility. This is the kind of film that could offer as much enjoyment to a child as it would an adult, something the studio clearly understands (they've already announced a sequel slated for 2017). By taking the road less travelled, Marvel and Gunn have turned this cult classic into a full-bodied feature that will likely have a huge following for years to come.